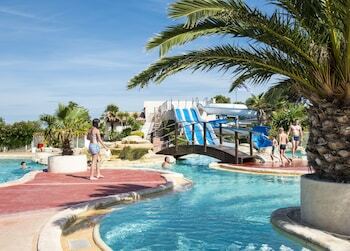 When you stay at Les Mûriers in Vendres, you'll be near the beach and 11 minutes by foot from Gulf of Lion. Featured amenities include multilingual staff and laundry facilities. Free self parking is available onsite. Located in Pleine-Fougeres, Domaine de Ville Cherel is within a 10-minute drive of Moulin de Moidrey and Alligator Bay. With a stay at Le Lodge Saint-frambault in Roeze-sur-Sarthe, you'll be within a 15-minute drive of Circuit de la Sarthe and 24 Hours of Le Mans Museum. Free self parking is available onsite. When you stay at Hotel La Truite Doree in Vers, you'll be 15 minutes by car from Cahors Cathedral. Free self parking is available onsite.